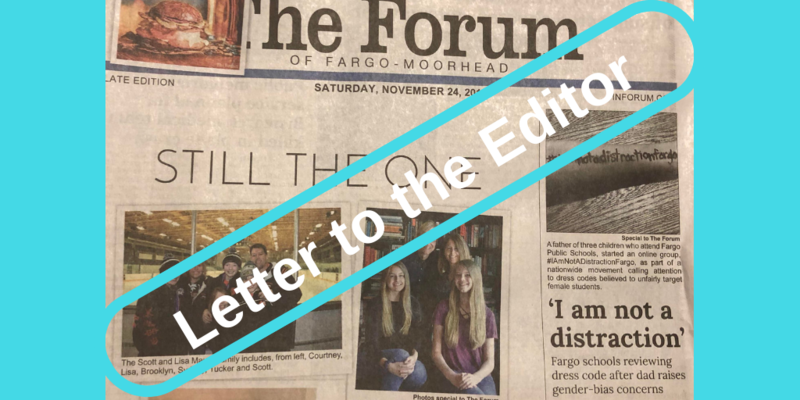 Letter to the Editor, The Forum, Fargo, N.D.
Mr. Fredricks’ objection to the dress code is not that there is one, but how the dress code is written. There are some sections which provide mostly objective, gender-neutral prohibitions such as banning ads for substances illegal for minors to use, coats in class, and so on. But the section he wants to address lists items most likely to be worn by girls and carries an implicit shaming message regarding girls’ bodies. It also includes reference to “any item deemed inappropriate by administration” which also creates a subjective standard. The code contains no references to clothing that might be inappropriate but more likely to be worn by boys rather than girls. The catch-all section regarding any clothing considered “distracting” also leaves enforcement wide open to subjective interpretation. Model dress codes have been developed, ranging in degree of what clothing is permitted (e.g. some school districts are OK with exposing the midriff, others are not), which are much more objective and avoid the gender-implicit language and application of dress codes such as the one Fredricks opposes. They also objectively define what is too short, too tight, too loose. Such codes have been established in many schools and are worth considering by the district.